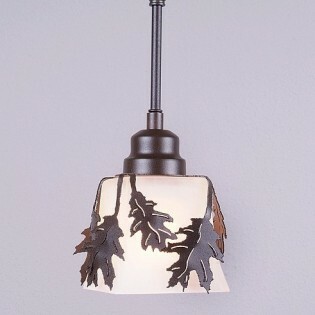 This oak leaf pendant light features a square mission style glass that is surrounded by a simple oak leaf design. The oak leaves have hand-cut interior lines which gives each image a unique look. This rustic pendant light is ideal for anyone looking for a small hanging light to add lodge style character to their log home or cabin. This oak leaf pendant light features a square mission style glass that is surrounded by a simple oak leaf design. The oak leaves have hand-cut interior lines which gives each image a unique look. This rustic pendant light is ideal for anyone looking for a small hanging light to add lodge style character to their log home or cabin. This pendant light includes a matching ceiling canopy that can be mounted on either a flat or vaulted ceiling.